I've got some flowers a couple of weeks ago and had to take some photos because that's what we do, right? We take photos of anything and everything to remember them when they are not around any more. Flowers are special, interesting and needed especially after a long and ugly winter. 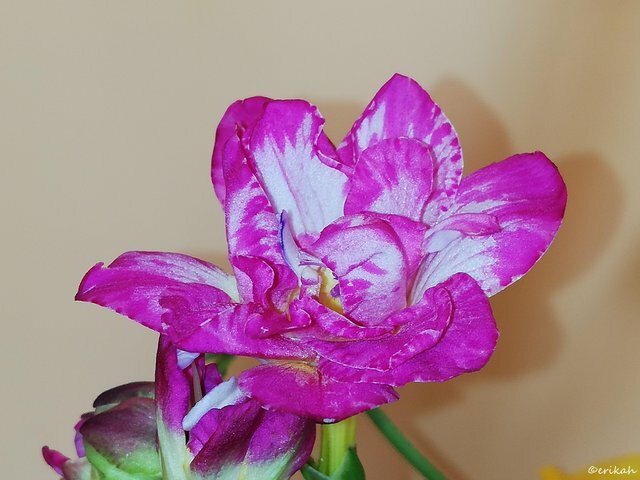 This was my lovely freesia, starting to open. 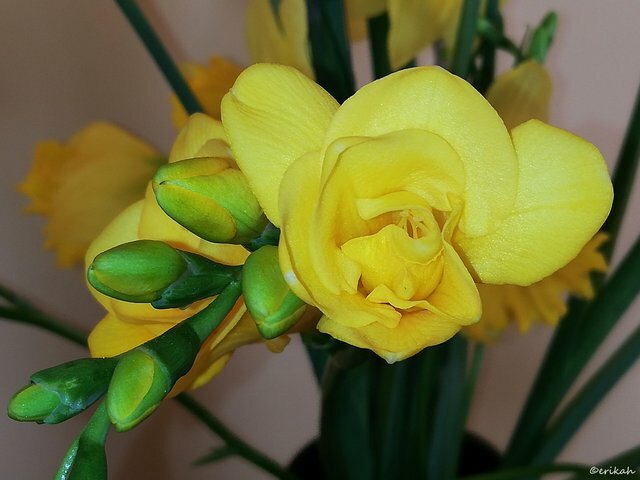 I love freesias, they mean spring to me and used to have such a nice fragrance, which has disappeared over the years. I don't know what's happened, maybe what I used to know was another species but what you can get nowadays don't smell, have almost no fragrance, which is a big shame. If you know how freesias smell, you know what I'm talking about. However, the petals of the flowers were beautiful. I love gradient, two toned petals. This is the other one, the yellow, which also had no fragrance at all but those petals are beautiful. I love the texture. Check out my #SevenDaysOutside Challenge! Make sure you write a description of the photo you are posting. Share as much details as you can, like where that statue is placed (in a park, at a museum), what it represents etc. Make it enjoyable. Use the #sevendaysoutside tag along with the daily tag and tag me, @erikah! Goes without saying that you can only use your own photos. No paintings, no drawings, no digital art please! There is no prize here, this is just for fun. eSteem is a Mobile📱& PC💻 app. for Steem with great features. Also, you get Incentives posting through eSteem apps. eSteem Spotlight; eSteem provides rewards for it top users in Leader Board with most Posts, Comments and Highest Earners.